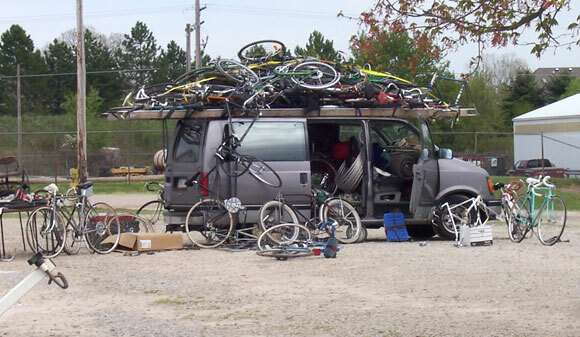 Ann Arbor Classic Bike Swap, here we come! VENDOR SET UP IS Saturday from 1pm-7pm ($20 fee), and Sunday 6:45am to 8:00am AT THE SOUTH PARKING LOT GATE. There is a raffle ticket in your envelope. The $5 Public admission (kids 10 and under FREE) to the Show at 8:00am provides the public with a variety of opportunities to participate in the bicycle collecting hobby like nowhere else in the nation. First and foremost are the Show bikes. Awards are presented to the first place winners in such categories as Best Unrestored, Best Lady's, Best Motorized Bike, Best Custom Classic, Best Early Classic, and the Best Bike of each decade 1930 through 1970. Entry is only $5. Next is the “Classic Bike of the Year Award”. This is a judged event, which focuses on some of the finest, rarest and most sought after bicycles in the bicycle collecting hobby. All of these bicycles are from private collections and are seldom seen outside of museums or auctions. The winner will be crowned “Classic Bike of the Year 2018”. The entry is $10. The Show features a Classic Bike Corral in Bldg. E. You put your bike in the Corral for only $10 and let the crowd decide it's value. If no one meets the owner's asking price, the bike goes back to the owner and they'll get $5 back. The result is an appraisal from the crowd for only $5. The $5 cost for the public to get into the Show includes a free door prize ticket. Prizes will be given away each ½ hour. This year, a minimum of 4 new collector bikes (not yet determined) will be given away to some lucky winners.You must be present to win and you can only get a chance by coming to the show. Extra tickets available. To all vendors: Rain or Shine, the show is on! We promote this show as a great event for the entire family. The bicycle displays will surely bring back many interesting memories to all the grown-ups whether it’s their first bike, their paper route bike, or even the bike that got stolen. It’s also an opportunity to fulfill a dream and finally get the bike you always wanted. Your swap space is reserved until April 13, 2019, then open spaces will be reassigned to fill the buildings. You may ask to change location. Earliest postmark gets the space. The Kleppert family along with it's dedicated unpaid volunteers hope to make this 38th anniversary show the best ever. We enjoy being the sponsors for this event and strive to keep it minimum cost, entertaining, rewarding, and most of all a fun trip. Along with Lisa and Harv at Memory Lane, this is the best weekend in the hobby. This is your meet as much as ours. Please copy, fax, e-mail, or post these pages and help promote your show to the public and future bike collectors.